Bill Villa Victims' Resource: Bill Villa's Malicious Lies, Half-Truths, Innuendo, and References to Violence: The "Foes List"
With misogynistic references to violence against women and vicious, racist attacks against distinguished African-American community leaders -- along with regular baseless smears against nearly 60 teachers, academics, journalists, lawyers, business professionals, civic leaders, civil rights leaders, and clergy members -- Bill and Angie Villa's "Lehigh Valley Somebody" has become known as one of the region's most vile hate blogs. Bill Villa Welshes on $3.1 Mil "Lie Bounty." Can't put his money where his mouth is! See the Plan Here! You Can Help! WAEB VP: Villa writes all his blog's comments himself under false names. VICTIMS: Isn't 62 too old for imaginary friends? Drunk Driver Bill Villa Demands Records of Fellow DUIs... But Frantically Tries to Hide His Own! Shocking Hypocrisy Exposed! Bizarre Delusion! Why He Needs to Victimize? * Do You Associate With Allebach Communications' Creative Director Bill Villa? * What Steps Are You Taking to Keep Yourself, Your Employees, and Your Families Safe From His "Foes List" Smears, Threats, and Abuse? * Want to Talk About It In Our Upcoming Documentary? Bill Villa's Malicious Lies, Half-Truths, Innuendo, and References to Violence: The "Foes List"
Bill Villa publishes on the web his “Foes List” of nearly 60 teachers, academics, journalists, lawyers, business professionals, civic leaders, civil rights leaders, and clergy members throughout his community. There he smears them with lies, half-truths, and innuendo and menaces them with ever-increasing references to violence. (See his blog Lehigh Valley Somebody and “Bill Villa’s References to Violence” in the right column of this page). He does so because of his delusional belief that his “Foes List” victims are arrayed in a vast conspiracy against him in support of the Lehigh County District Attorney and a suit the DA has brought against him. Bill Villa (a former long-time illegal drug abuser, alcoholic, and ARD drunk driver) strives to have his delusional, unfounded online attacks appear, as he puts it, “frequently and prominently” on the first pages of Google searches so as to damage to the broadest extent possible the personal and professional reputations of his “Foes List” victims. Mr. Villa works in the advertising industry and is Creative Director at food and beverage advertising agency Allebach Communications, Souderton PA. He first contacts a victim with his abusive false accusations and demand(s). He has also threatened victims with violence -- for example asserting that he is weighing whether to attack with "brass knuckles or bare knuckles." When rebuffed, Bill Villa issues a threat to place his victim on his “Foes List” and details the manner in which he intends to damage his victim’s personal and professional reputation -- promising, in his words, "frequent and prominent" appearance of his baseless accusations on the first pages of Google searches for the victim’s name and/or employer. He has made false claims that the spouse of a victim has left him/her -- while in fact he himself is a divorced man. He has made false claims that a victim is failing in his/her career/business - while in fact his business, À la carte Advertising, failed in 2015 forcing him to accept a near-entry-level position at 62 years of age. For an indefinite period after induction into his “Foes List”, Bill Villa will carry out attacks on the reputation of the victim and in many cases the victim’s family (especially female family members) and associates. If a “Foes List” victim rebuts Bill Villa's baseless accusations in another forum, Mr. Villa claims he has been "libeled" and again accuses his victim of "torturing a grieving family" and often threatens frivolous legal action in retaliation. Hence he has come to commonly be referred to as a "crybully." 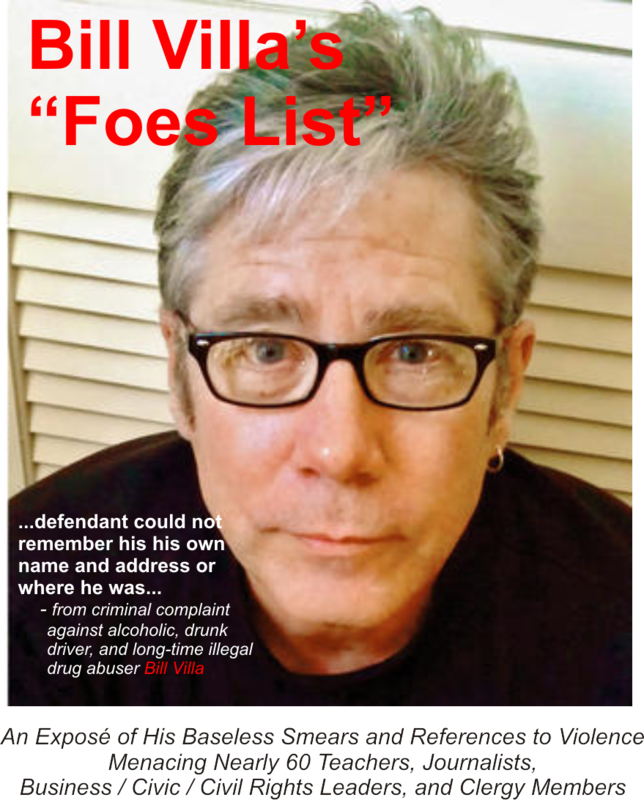 Bill Villa's “Foes List” has grown to include victims who have never even spoken to nor met him. Since the article's publication, Bill Villa’s abuses have metastasized to their current appalling state. Even innocent bystanders are viciously smeared in this fashion simply because they refused Mr. Villa's demand to fire a member of his “Foes List”, or because they maintain a business or personal relationship with a “Foes List” member, or simply because they speak out on political issues (entirely unrelated to Bill Villa) in a forum of which Mr. Villa does not approve. And yet he compulsively continues his baseless accusations and increasingly ominous references to violence. Bill Villa, himself a ARD drunk driver who for many years was a deeply troubled alcoholic and illegal drug abuser, suffered the tragic death of his daughter as a passenger of a drunk driver in a 2006 DUI-related crash -- those factors together almost certainly contributing to his current deranged and belligerent behavior. Bill Villa has emailed a family member of a “Foes List” victim questioning whether he should attack the victim "with bare knuckles or brass knuckles" for suggesting that Villa's kind, gentle, universally loved and admired daughter would be ashamed of his belligerent behavior and malicious hate blog -- and that Villa's actions dishonored her memory. Another “Foes List” victim received an email from Bill Villa saying that he was "certain" that "God" was "on that" to bring about the victim's "slow and ugly death" and closed with a phrase around the victim "chugging cheap wine in hell with [the name of a member of the victim's family] soon." Immediately after this, as a chilling coda, Bill Villa quoted fictional serial killer Hannibal Lecter on his blog. Bill Villa has indicated on his Facebook page that he believes there is an effort on the part of Lehigh County District Attorney James Martin and Sprague & Sprague (one of the country’s leading law firms) to “bait” him to, referring to an affiant and potential witness in a case brought against him by the District Attorney, "punch the nose out through the back of his head". Bill Villa has stalked a “Foes List” victim and reported on his blog “Lehigh Valley Somebody” the exact time he was following the victim along with the victim’s exact location and apparel (down to the type of backpack) on an early morning walk. In the same post he mentioned the victim’s wife by name, strongly implying that she was home alone. Bill Villa has exposed on the web the personal contact information of a victim's younger sister, a single woman living alone who had never had a conflict with Villa in any way. Scribd.com’s legal team removed the invasion of privacy having deemed it presented a provocative danger to her. Despite the "conspiracy” on the part of of his “Foes List” victims being entirely of Mr. Villa’s imagining, the damage to the reputations and peace-of-mind of his victims and their families is very real. With his abuses continuing to become more and more bizarre and extreme, Bill Villa, Creative Director at Allebach Communications in Souderton PA, has been twice ordered by his employer Jamie Allebach, Chief Executive and Creative Officer. to cease his “Foes List” abuses on company time. If you are a “Foes List” victim being attacked online by Bill Villa during standard business hours, direct all inquiries to Jamie Allebach, Chief Executive and Creative Officer, Allebach Communications, Souderton PA.
Obviously, anyone associating with Bill Villa on a personal or professional basis should exercise extreme caution and take all proper precautions. At the first sign of trouble, it would be prudent for these individuals to share their concerns with their local police department and, if engaged in a professional interaction with Bill Villa, also share those concerns with his employer Jamie Allebach, Chief Executive and Creative Officer at Allebach Communications. Because anyone can be added to Bill Villa's “Foes List” for the most trivial or imagined “offenses”, anyone even remotely in Mr. Villa’s orbit (and their family and associates) is at risk for a sustained, vicious smear campaign and threats of violence. We are striving to ensure these rebuttals and this information resource appear in Google searches as frequently and prominently as do Mr. Villa’s baseless attacks. For many years, Bill Villa's baseless attacks and delusional conspiracy theories were tolerated by his victims and the community at large out of compassion and pity for his loss. Finally, however, after a decade of lies, half truths, innuendo, and references to violence, the time has come to put a stop to Mr. Villa's continued abuse of so very many entirely decent, law-abiding members of his community. His daughter's tragic and tragically needless death has become an excuse for his compulsion to launch vindictive, unsubstantiated attacks against accomplished, successful, and highly productive members of his community -- not the cause of it. We cannot stress enough that we are not in any way here to vindictively take retribution against Bill Villa. Our hope is that he will remove from the web his “Foes List” and all associated attacks on us so that we can, in turn, remove this information resource site from the web. We want nothing more than for Bill Villa to put his decade of hate, obsessive abuse, and violent references behind him and rejoin the community as a peaceful, productive citizen. Bill Villa increasingly resorts to violent references in an effort to intimidate his “Foes List” victims. He has emailed a family member of a “Foes List” victim questioning whether he should attack the victim "with bare knuckles or brass knuckles." Another “Foes List” victim received an email from Villa saying that Villa was "certain" that "God" was "on that" to bring about the victim's "slow and ugly death" and closed with a phrase around the victim "chugging cheap wine in hell with [the name of a member of the victim's family] soon." Immediately after this, as a chilling coda, Villa quoted fictional serial killer Hannibal Lecter on his blog. Villa has indicated on his Facebook page that he believes there is an effort on the part of Lehigh County District Attorney James Martin and Sprague & Sprague (one of the country’s leading law firms) to “bait” him to "punch the nose through the back of the head" of an affiant and potential witness in a case brought against him by the District Attorney. He has stalked a “Foes List” victim and reported on his blog the exact time, location, and apparel of the victim on a morning walk. In the same post he mentioned the victim’s wife by name, strongly implying that she was home alone. Given that Mr. Villa’s references to violence are increasingly menacing, should you hear Mr. Villa referring to violence in the workplace or elsewhere, contact your local police department immediately. If you associate with Bill Villa on a professional basis as a colleague or client, or if you are the target of abusive posts or emails from him during standard business hours, address all correspondence to Jamie Allebach, Chief Executive and Creative Officer, Allebach Communications, Souderton PA. Questions Bill Villa refuses to address... with answers he doesn't want you to know. Emailing a family member of a “Foes List” victim questioning whether you should physically attack the victim "with bare knuckles or brass knuckles"
Sending an email stating you were "certain" that "God" was "on that" to bring about one of your victim's "slow and ugly death", closing with a phrase around the victim "chugging cheap wine in hell with [the name of a member of the “Foes List” victim's family] soon." Then, shortly thereafter, quoting fictional serial killer Hannibal Lecter. What is your purpose in these communications other than attempts at intimidation? You have exposed on your blog information such as the personal contact data, place of employment, and work photograph of both the wife and younger sister of an affiant and potential witness in the District Attorney’s case against you. Can you identify your purpose in your doing so for any reason other than an attempt at intimidation? You make the false claim that an affiant and potential witness in the District Attorney’s case against you has a “contract” with the District Attorney and Sprague & Sprague (one of the nation’s leading law firms) to drive business to the affiant's firm in return for his affidavit. You lie in your attempt to offer “proof” of this by posting a small, highly modified excerpt of your “Foes List” victim’s affidavit which obscures all of its pertinent details at www.scribd.com/document/317853540/Enlisted-Affiant. Can you name a purpose for your lie other than an attempt at intimidation? Your employer (Jamie Allebach, Chief Executive and Creative Officer, Allebach Communications, Souderton PA) forbid you from carrying-out your "Foes List" abuses during working hours. You failed to comply with his directive, and were for a second time ordered by Mr. Allebach to put a stop to your working hours abuses. Has Mr. Allebach specified a penalty should you again run afoul of his instructions when victimizing members of your "Foes List"? Has he warned your coworkers of your propensity to vandalize reputations on a whim with lies, half-truths, and innuendo via your web-published "Foes List" so as to enable these innocent people to take proper precautions when interacting with you? Has any similar warning been issued to clients of Allebach Communications? You frequently make unsubstantiated accusations of criminal activity against many of your nearly 60 "Foes List" victims and have done so for nearly a decade. Amid those many lies, you have yet to produce even a single shred of remotely credible, actionable evidence of any criminal wrongdoing... Against anyone... For any crime... Ever. Can you present even a single “verifiable fact” to support your so far unsubstantiated accusations of criminal activity? You often publish small snippets of emails or other correspondence from your “Foes List” victims entirely out of context and sometimes with misleading modification. Would you be willing to post these exchanges in context, unmodified, and in their entirety? Or are you intentionally presenting correspondance in a false light so as to malign your “Foes List” victims? Can you explain why WAEB no longer wants any association with you despite your numerous false claims to the contrary? Craig Stevens, Senior Vice President of Programming at WAEB Newsradio, has, according to a court document, stated that you mislead your blog readers by writing the comments on your blog yourself. The fictitious names under which you presumably do so include “Monkey Mambo”, “455 W.Hamilton St”, “Consigliere”, “The City Official”, “LCVI”, “The Banker”, etc. In fact, other than your name and your wife’s, it’s nearly impossible to find a comment on your blog associated with a verifiably real person with a real name. You claim to run StatMeter so as to log the identities of visitors to your site (whom you misleadingly call “stalkers”). Can you, using the StatMeter data you claim to have, disprove Mr. Stevens assertion? "Bill V has been recovered and sober since July 26, 1987"
Given what appears to be frequent and ongoing bizarre, delusional, and belligerent behavior on your part -- with frequent references to violence -- can you produce any "verifiable facts" to substantiate your claim? Where, for example, did you do your alchohol and illegal drug addiction rehabilitation? You continue to hide your own DUI records behind an expungement while demanding the DUI records of many of your fellow drunk drivers. When will you be releasing the records concerning your own DUI? What was your Blood Alcohol Concentration (BAC) at the time of your arrest? Were there any traces of illegal drugs in your system at the time? You accuse a community and civil rights leader on your "Foes List" of being a "scofflaw" (and go on to level the same charge against his wife). And yet you spent many years as an illegal drug addict presumably buying street drugs. By your own definition, were you not also a "scofflaw" during the many years you were addicted to illegal drugs? "Jim Martin is a well-known drunk. Quote me and I’ll deny saying that." Can you produce any "verifiable facts" substantiating your accusation against Ms. Mann? "Bill Villa, These are the seeds of dangerous physical injury." to journalist Mike Molovinsky. Do you have any "verifiable facts" to prove that he did indeed say that? "[Morning Call columnist] Bill White responds by publishing an un-hinged and profane name-calling comment at his blog that’s deleted at our request by Morning Call online editors Marc Rosenberg and Elizabeth Bartolai overnight"
Can you present the "verifiable fact" of a direct quote? "Tom Corbett approved transparently bogus/phony "harassment" charges…"
Do you have any "verifiable facts" to show that it was approved by the Governor and not simply a routine action by a junior functionary in the Attorney General’s office who approved the criminal charges against you? For that matter, do you have any "verifiable facts" to show that former Governor Corbett had any knowledge whatsoever of you or any matters concerning you? You make numerous attacks on your blog against former City Council member and Cedar Crest College Professor Mike Donovan. Do you have any "verifiable facts" to establish that he was, in fact, guilty of "criminal harassment" as you allege? If so, why did you fail to file a complaint with law enforcement? Given that you continue to disparage him on your blog, are you aware Professor Donovan is deceased? Or are you doing so simply to "punish" his surviving spouse and children? You publish a lengthy exchange on your blog with an anonymous individual, supposedly from a wealthy and prominent Allentown family, who makes numerous accusations against District Attorney Jim Martin. Can you produce any "verifiable facts" to substantiate his charges? Or are you simply fabricating? "So [District Attorney] Jim [Martin], what the heck happened to your black Cadillac SUV? The driver’s side was all side-swiped a bright green color like you took out a fence or a row of hedges or something after a night at the Hogan’s Club. Note: I have cc’d Allentown Chief of Police Roger MacLean on this email, just in case there’s an unsolved DUI hit and run that fits your description." Do you have any "verifiable facts" to support your insinuation, or is it simply baseless innuendo? "Bill, there’s a well-known working alliance between D.A. James Martin and the Allentown School District’s David Elcock-- they work very closely in coordinating presentations on "Sexting" at ASD schools. David Elcock is supposed to be Director of Human Resources (wink wink) but obviously has plenty of extra time on his hands for sexting (presentations) with D.A. James Martin. What’s the over/under that H.R. Director David Elcock and D.A. James Martin have discussed blacklisting Angie Villa from full-time employment in the ASD? Inquiring minds want to know." Can you produce any "verifiable facts" to support this currently unsubstantiated speculation against Mr. Elcock? “That's why LVS is offering a $3.1 MILLION REWARD to any emailer who Specifies & Proves a lie I've told about anything or anyone on the so called “Enemies List” they’re all so concerned about. Now, one of your many lies has been demonstrated and sent to your attorney Michael Shay by one of your "Foes List" victims - with several more to follow. You, however, are refusing to execute the transaction and deliver your promised payment -- despite your "Foes List" victim’s offer to contribute that payment in its entirety to the bona fide Sheena Villa memorial fund of your choice. Why are you defaulting on your globally published offer? Villa had been conducting his “Foes List” abuses during standard business hours. His employer Mr. Allebach put a stop to that. When this was brought to the attention of Jamie Allebach, Chief Executive and Creative Officer at Allebach Communications he exhibited great professionalism and integrity (and courage -- given that it could land him on Bill Villa’s “Foes List” one day) and forbid Bill Villa from continuing to do so on company time. While this does not entirely solve the problem of Mr. Villa’s abusive online rants, lies, and frequent references to violence in its entirety, it was certainly all that was in Mr. Allebach’s power to do, and Mr. Villa's nearly 60 “Foes List” victims are quite grateful. We provide a forum for victims of Bill Villa’s 60+ “Foes List” to rebut his lies, half-truths, and innuendo. We intend that this information resource appear in Google searches for both our names and Mr. Villa’s as frequently and prominently as do Mr. Villa’s baseless attacks and references to violence. Indeed, our sense of urgency increases by the day given that Mr. Villa -- a deeply troubled alcoholic, ARD drunk driver, and former long-time illegal drug addict -- spews ever-increasing references to violence against the “Foes List” victims he has for so long been smearing with lies, half-truths, and innuendo. We also make this information resource widely available to serve as a warning to as many people as possible who, by associating with Mr. Villa (Creative Director, Allebach Communications, Souderton PA) on a personal or professional basis, are at risk of being victimized by Mr. Villa and his unhinged “Foes List” attacks. This in the hope that they take all appropriate precautions when interacting with Bill Villa to prevent serious damage to their personal and professional reputations -- and the reputations and peace-of-mind of their families and associates (favorite targets of Bill Villa when he chooses a new “Foes List” victim). The Marketing and Advertising staffs of mid-sized food and beverage manufacturers throughout the U.S.
we might bring Mr. Villa to his senses and incent him to remove from the web his “Foes List” and all associated attacks on us so that we can, in turn, remove this information resource site. We want nothing more than for Mr. Villa to put his decade of hate and compulsive spewing of lies, half-truths, innuendo, and violent references behind him and rejoin the community as a well-adjusted, productive citizen. We're here to help if you let us, Bill.